Jack Rasmussen. 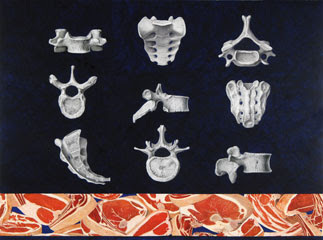 Boned, 2008. Acrylic and collage, 18x24 inches. Jean Albano Gallery in Chicago and it is not only noteworthy because of the very cool art in this group show, but also because it includes the above piece by my good friend Jack Rasmussen; his first exhibit in 30 years! Quincy Jones has started a petition to ask President-elect Obama to appoint a Secretary of the Arts. While many other countries have had Ministers of Art or Culture for generations, the United States has never created such a position. Although I am generally opposed to expanding government, we in the arts community need this and the country needs the arts -- now more than ever. If you feel that this is a decision that you can support, then please take a moment to sign this important petition and then pass it on to your friends and colleagues. My thoughts on some candidates for the position, and my ideas on how to keep a new Department of the Arts from becoming a huge burocratic mess will come later. 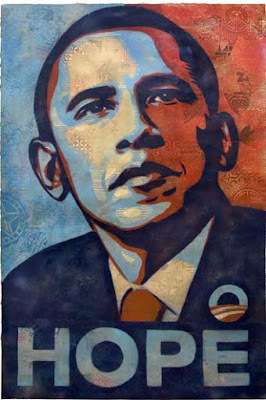 The stencilled portrait of President Elect Obama by street artist Shepard Fairey, which became the key image of the Obama election campaign and did wonders for Fairey, has been acquired by the National Portrait Gallery in Washington, DC for its permanent collection. Of peripheral interest, artist Shepard Fairey has been under a lot of scrutiny in the internets for his alleged violations of intellectual property in lifting imagery and design from Third World artists. Read all about it here. If these allegations are true... well you see where this is heading. Also, at the risk of being pedantic, it was my understanding that all contemporary portraits in the NPG had to be executed from the live person. In other words, they couldn't be done from a photograph, etc. I will contact the NPG and ask them about this. I am assuming that Fairey did his famous portrait of Obama from an appropriated photograph, rather than have Barack pose for him. 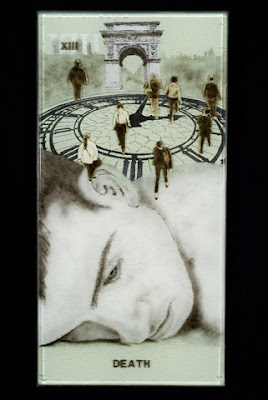 For a couple of years now I have been telling you to acquire Michael Janis' artwork. From the 1,047 artists from 43 countries sending almost 3,000 images, 100 were selected for publication in New Glass Review, the Corning Museum's annual international publication of glass artists. The judges were Rachel Berwick, Department Head of Glass, Rhode Island School of Design; Mieke Groot, independent curator, Amsterdam, The Netherlands, and uber glass artist Dante Marioni, from Seattle, Washington, which (as glass freaks know) is the fine arts glass capital of the upper crust of the fine arts world and one of the world's most beautiful cities. And the DC area's own Michael Janis, from the Washington Glass School, is in that exclusive group in the forthcoming book for 2009. Death, Tarot Card Series. By Michael Janis. Cast glass, steel, glass powder, 18" x 36" x 2"
Artists from the Washington Glass School continue to push the envelope of contemporary glass, and yet their own city's museums seem to be the only ones lagging in spotting them ahead of the rest of the art world. But for now all that I have to say is "Congratulations Mike!" A while back in the mail I got some preview tickets to the opening of the new Steven Soderbergh two-part epic about the life of Ernesto "Che" Guevara, the Argentinean blue blood guerrilla leader, starring Puerto Rican actor Benicio Del Toro in the leading role (which has already earned him the coveted Best Actor award at the 2008 at the Cannes Film Festival). Because I was away on vacation, I couldn't go, but I do plan to see this film, as I have been an avid Guevara follower nearly all my life. Here's a little known Guevara fact: His paternal grandparents, Roberto Guevara and Ana Lynch, were born in California! My father fought alongside Guevara during the Cuban Revolution, and like most of those brave young men who fought against the Batista dictatorship (both in the mountains of Oriente province and the streets of Havana and Santiago de Cuba) he never expected the Cuban Revolution to institutionalize a worse dictatorship than Batista's bloody regime. Che was a declared Communist all along, but Communists were rare in the ranks of the rebels. In fact, to this day most people don't know that the official Cuban Communist Party was part of the Batista government while the Revolution was underway and even Guevara, a Communist all along, had harsh words for the Cuban Communists during the struggle. In 1958 he wrote that there were "mutual fears" between the rebels and the Party, and "fundamentally, the Party of the Workers has not perceived with sufficient clarity the role of the guerrilla." After the revolution, Guevara further added that he "only knew of three Communists who had participated in combat." Besides himself and Raul Castro, one wonders who the third Communist was (Raul Castro's future wife, Vilma Espin was also a known Communist; however, she was one of the urban guerrillas working under Frank Pais, the anti-Batista leader in the streets of Cuba. Pais was strongly anti-Communist. Of interest, a persistent rumor blames Espin as the traitor responsible for Pais' death at the hands of the Batista police. Fidel Castro himself, always denied being a Communist, until sometime in the early 1960s. Guevara was a very courageous and even reckless fighter (as opposed to Castro, who spent most of the war secluded in the relative safety of the Sierra Maestra mountains). But Che was also the grim executioner of the Cuban Revolution, a fact that he never hid and even bragged about, but which most Guevara admirers conveniently ignore. 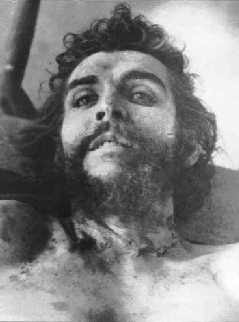 It was Guevara who executed deserters and captured Batista soldiers and henchmen during the struggle; and it was Guevara who signed many of the tens of thousands of execution orders after the Revolution, when Cuba was bathed in blood by avenging firing squads. See some of the documented Cubans executed by Guevara (including over a dozen shot by Che himself) here or if you have the guts, you can see an actual firing squad in action (broadcast over Cuban TV in 1959). Because of that, Guevara is known to Cubans as "El Chacal de La Cabaña." "El Chacal de La Cabaña" translates to the "Jackal of La Cabaña," although it is usually translated as the "Butcher of La Cabaña." La Cabaña is an 18th century fortress complex located on the elevated eastern side of the harbor entrance to Havana, and the location for many of the thousands of firing squad executions which took place after January 1, 1959. Shot were former members of Batista's police, army and air force, informants, traitors, and counter-revolutionaries. The best known story about this period (which I heard related in a Spanish language radio show in Florida last week) relates to how a Cuban mother went to see Che to beg for her son's life. The son was 17 years old, and was on the firing squad list, to be executed within a week. If Guevara pardoned her son, the mother begged, she would ensure that he never said or did anything against the Revolution. Che's response was to order the immediate execution of the boy, while the mother was still in his office. His logic: now that the boy was shot, his mother would no longer have to anguish over his fate. On the other hand, Che's courage as a guerrilla leader and his dedication to his caused are well documented and never challenged and cost him his life. While Fidel Castro tightened his grip on the Cuban people and replaced the Batista dictatorship with the Castro dictatorship, Guevara put his life at risk fighting in guerrilla wars in Africa and Latin America, until he was caught in the highlands of the Bolivian mountains in 1967 and executed on the spot. Just as he would have done had the situation been reversed. It is this glowing side of Che's complex character that Che's admirers and apologists always focus upon, and I am looking forward to seeing if this film addresses both the spectacularly courageous side of this iconic figure, as well as his war crimes and dark side of a man with little compassion and remorse. I am also curious as to how the film handles Guevara's departure from Cuba. "Che", claims Dariel Alarcon Ramirez, who joined the rebels in 1956 and then went with Guevara to Bolivia, "left Cuba after being accused of being a Trotskist and a Maoist.... and because of the problems he had with the Cuban government, specifically Fidel and Raul Castro." Once I see the film, I will tell you my thoughts on it. Meanwhile below are the lyrics (translated from the Spanish) from Olafresca's song titled "El Chacal."